COMMENTS:        This trigger occurred at longitude,latitude = 11.83,-10.11 [deg]. COMMENTS:        This trigger occurred at longitude,latitude = 241.63,11.25 [deg]. Dec(J2000) = +57d 32' 36"
with an uncertainty of 3 arcmin (radius, 90% containment, including systematic uncertainty). As is typical for image triggers, the BAT light curve does not show anything significant over the trigger window. However, at ~T+150 sec there is a flare in the light curve (~1300 cnts/sec). Dec(J2000) = +57d 33' 55.8"
We note the presence in the XRT raw light curve of a large X-ray flare coincident with the BAT flare mentioned above. A power-law fit to a spectrum formed from promptly downlinked event data gives a column density consistent with the Galactic value of 2.35 x 10^21 cm^-2 (Willingale et al. 2013). UVOT took a finding chart exposure of 150 seconds with the White filter starting 137 seconds after the BAT trigger. No credible afterglow candidate has been found in the initial data products. The 2.7'x2.7' sub-image covers 100% of the XRT error circle. The typical 3-sigma upper limit has been about 19.6 mag. The 8'x8' region for the list of sources generated on-board covers 100% of the XRT error circle. The list of sources is typically complete to about 18 mag. No correction has been made for the expected extinction corresponding to E(B-V) of 0.20. Dec (J2000): +57d 33' 56.0"
"At 16:10:11.39 UT on 12 September 2016, the Fermi Gamma-Ray Burst Monitor triggered and located GRB 160912A (trigger 495389415 / 160912674). This burst was also detected by the Swift BAT approximately 150 s after the Swift trigger time and reported as an x-ray flare approximately 89 arcseconds from the BAT onboard position (Cannizzo et al. 2016, GCN 19912). At the time of the Swift trigger, the source was occulted by the Earth for Fermi. The GBM on-ground location is consistent with the Swift position. The GBM light curve consists of multiple peaks with a duration (T90) of about 48 s (10-1000 keV). The time-averaged spectrum from T0-4 s to T0+42 s is best fit by a simple power law function with index -1.48 +/- 0.03. The event fluence (10-1000 keV) in this time interval is (6.1 +/- 0.3)E-06 erg/cm^2. The 1-sec peak photon flux measured starting from T0+8.4 s in the 10-1000 keV band is 1.6 +/- 0.2 ph/s/cm^2. 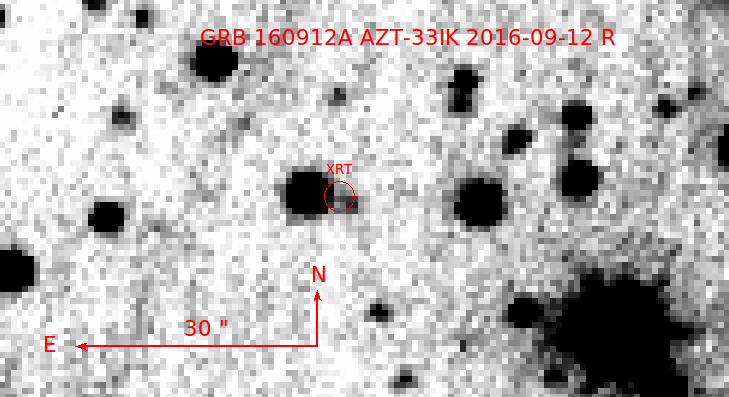 We have analysed 8.0 ks of XRT data for GRB 160912A (Cannizzo et al. GCN Circ. 19912), from 119 s to 36.9 ks after the BAT trigger. The data comprise 776 s in Windowed Timing (WT) mode (the first 9 s were taken while Swift was slewing) with the remainder in Photon Counting (PC) mode. The enhanced XRT position for this burst was given by Beardmore et al. (GCN Circ. 19915). The late-time light curve (from T0+5.8 ks) can be modelled with a power-law decay with a decay index of alpha=. A spectrum formed from the WT mode data can be fitted with an absorbed power-law with a photon spectral index	of 1.63 (+/-0.04). The best-fitting absorption column is 2.80 (+/-0.20) x 10^21 cm^-2, in excess of the Galactic value of 2.4 x 10^21 cm^-2 (Willingale et al. 2013). The PC mode spectrum has a photon index of 1.81 (+0.11, -0.10) and a best-fitting absorption column of 3.0 (+/-0.5) x 10^21 cm^-2. The counts to observed (unabsorbed) 0.3-10 keV flux conversion factor deduced from this spectrum is 4.2 x 10^-11 (5.6 x 10^-11) erg cm^-2 count^-1. The results of the XRT-team automatic analysis are available at http://www.swift.ac.uk/xrt_products/00711914. We observed the field of Swift GRB 160912A (Cannizzo et al. GCN 19912) with the 2m Liverpool Telescope on La Palma with the IO:O camera. Given the evidence for fading, we conclude this is likely the optical afterglow of the GRB. The J2000 position of the source is 20:05:59.68 +57:33:54.9 to an accuracy of about 0.5". The Swift/UVOT began settled observations of the field of GRB 160912A 138 s after the BAT trigger (Cannizzo et al., GCN Circ. 19912). There is a weak detection of a source consistent with the XRT position (Beardmore et al., GCN Circ. 19915) and the optical afterglow positions (Tanvir and Levan, GCN Circ. 19918; Mazaeva et al., GCN Circ. 19919) in the initial UVOT exposures. There is little evidence for variability. The magnitudes in the table are not corrected for the Galactic extinction due to the reddening of E(B-V) = 0.20 in the direction of the burst (Schlegel et al. 1998). We observed the field of GRB 160912A (Cannizzo et al., GCN 19912) with the Reionization and Transients Infrared Camera (RATIR; www.ratir.org) on the 1.5m Harold Johnson Telescope at the Observatorio Astron=F3mico Nacional on Sierra San Pedro M=E1rtir from 2016/09 13.14 to 2016/09 13.24 UTC (11.20 to 13.52 hours after the BAT trigger), obtaining a total of 1.76 hours exposure in the r and i bands and 0.74 hours exposure in the Z, Y, J, and H bands. Dec(J2000) = +57d 35' 04.8"
with an uncertainty of 2.7 arcmin, (radius, sys+stat, 90% containment). The partial coding was 96%. The mask-weighted light curve shows some weak emissions that starts at ~ T-33 s, and a FRED-like pulse from ~T+140 s to ~T+200 s. We do not have much information of the burst emission afterwards due to some large gaps in the data after ~T+320 s.
The time-averaged spectrum using the available data from T-33 to T+211 sec is best fit by a simple power-law model. The power law index of the time-averaged spectrum is 1.43 +- 0.11. The fluence in the 15-150 keV band is 3.7 +- 0.3 x 10^-6 erg/cm2. The 1-sec peak photon flux measured from T+148.56 sec in the 15-150 keV band is 1.6 +- 0.2 ph/cm2/sec. All the quoted errors are at the 90% confidence level. The AMI Large Array robotically triggered on the Swift alert for GRB 160912A (Cannizzo et al., GCN 19912) as part of the 4pisky program, and subsequent follow up observations were obtained up to 10 days post-burst. Our observations at 15 GHz on 2016 Sep 12.72, Sep 13.81, and Sep 18.87 (UT) do not reveal any radio source at the XRT location (Beardmore et al., GCN 19915), with 3sigma upper limits of 147 uJy, 258 uJy, and 102 uJy respectively.